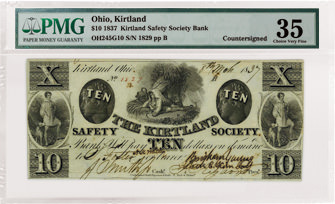 This $10 bank note was placed into circulation by the Kirtland Safety Society Anti-banking Company. The Kirtland Safety Society bank was proposed by Joseph Smith Jr., founder of the Latter Day Saint movement in 1836 and organized as a quasi-bank and joint stock company in January of 1837. The bank was intended to boost the economy and serve the financial needs of the growing Mormon population in Kirtland, Ohio. In November 1836 church leaders drew up articles for a bank to be used as part of the petition for a bank license from the state legislature. As Orson Hyde went to Columbus seeking the bank charter, Oliver Cowdery went to Philadelphia to purchase plates to print the bank notes. The bank charter was not approved by the legislature, however. According to Smith and some of his followers, he received an audible message from God instructing him to open a “banking anti-banking institution” and it was decided by the church to proceed printing banknotes, hand inserting “Anti-” in front of “Bank” and attaching “ing” to the end of the lower denomination notes. Once complete the notes read “Kirtland Safety Society Anti-Banking Company,” and were passed as legal tender from the quasi-bank. The practice of altering the notes did not last long though and notes denominated from $5 through $100 were never changed. Joseph Smith served as the organization’s cashier and Sidney Rigdon was the Chairman and President. At first the notes circulated widely but as more sophisticated non-Mormon merchants began redeeming the notes it became obvious to Smith and Rigdon that the “bank” would fail and they resigned their posts. Other individuals from the church took over the bank responsibilities until the organization closed its doors in November. At the time of closing there was about $100,000 is unresolved debt. Some people were convinced that the organization was intended as a swindle from the very start. Smith and Rigdon were prosecuted and fines $1,000 each for running an illegal bank and many other lawsuits were brought up against the Prophet and the Kirtland Safety Society. Some church leaders urged holders of the valueless notes to keep them, saying that someday they would have value again. While this never came to be, the notes eventually became collector’s items. 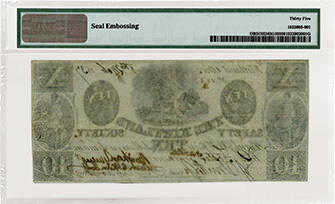 The note has signatures of Joseph Smith, Jr. and Sidney Rigdon with countersignatures of Brigham Young and three other signers. The date and serial numbers are hand written. 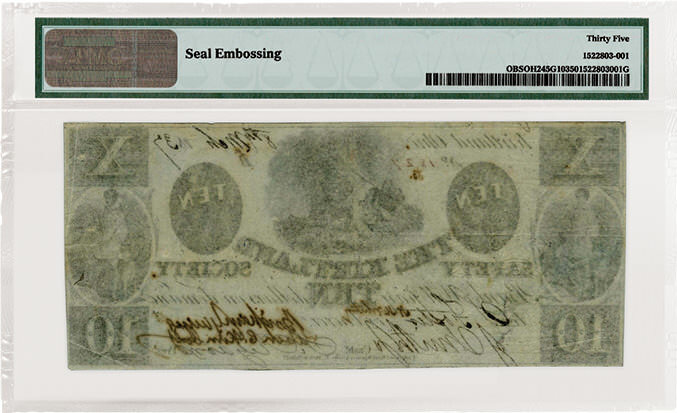 The notes were printed by Underwood, Bald, Spencer & Huffy which eventually became part of the American Bank Note Company — the world’s foremost engraver and printer of bank notes and securities.